The commitment of the “Kids on the Move!” can not just help our climate, but through contributing support to the Solar Lamps Projects it also helps children in the Amazon Rainforest gain access to eco-friendly and healthy light. Parents, grandparents, neighbours, friends, colleagues or also businesses can, similar to a sponsored run, donate a contribution of for example 10 cents for a mobile solar lamp for each footprint collected by the children during their Climate Action Week, then their own small contribution can have a large effect! 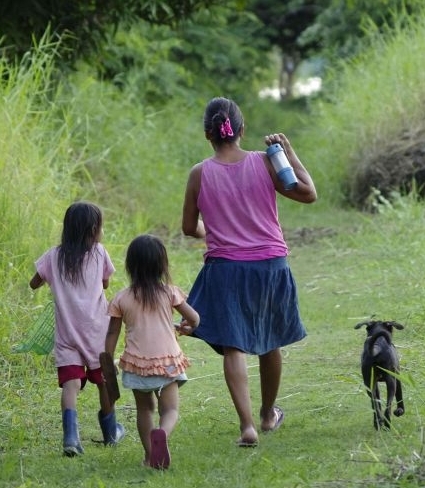 In Amazonia only a small part of the population has access to a public power supply. The rural and indigenous populations in remote villages are especially affected. Petroleum is the source of energy and light for all of them, however it brings with it strong negative effects: through combustion, smoke and soot lead to the development of various health problems in families. Also, eye damage through relatively weak light occurs again and again. CO2 emissions have environmental and climate-damaging effects. A further problem is the procurement and cost of light petroleum. It must be brought to the community and depending on the distance to the next city, costs are often high and availability not always guaranteed. One possibility to circumvent these problems is the introduction and distribution of solar light, in the form of small decentralised photovoltaic energy-saving lamps. The higher efficiency of the electric light is, alongside the environmental and health benefits of use, a decisive advantage and a contribution to the improvement of the living conditions. Further information on the Solar Lamps Project here (pdf, 100kb) and on our website on Indigenous Peoples. Please also use Stopover No. 11 of our "Climate Voyage Around the One World" to learn more about the situation of the children in the Peruvian National Park Pacaya Samiria.